deeds for any state and county that’s designed for your success. DeedNetwork was created to solve the problems everyone faces when drafting deeds. Login to access all of our notes, tips and tools to prepare your deed correctly using your templates or ours. Choose if you are going to use your own templates to create deeds or use DeedNetwork’s deed templates. If you get stuck, call us. We can answer your questions with confidence. We have a document team that can prepare and record the more difficult deeds for you. Many DeedNetwork users prepare deeds themselves using the apps they are most accustomed to. 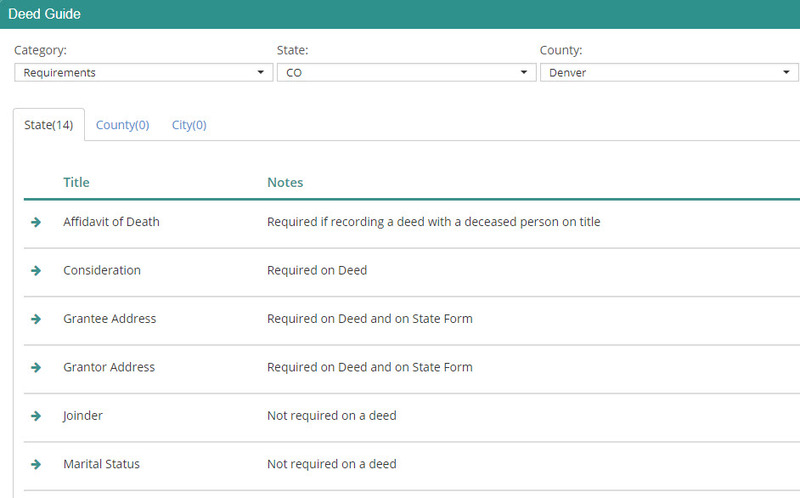 DeedNetwork can help by filling in the gaps by providing county specific information and tools to ensure each deed prepared is recorded the first time. Drill down to every little detail that all 3,600 counties individually require on deeds using our knowledge base. Eliminate the county rejecting your deeds for missing information. Use DeedNetwork’s knowledge base to help you every step of the way whether you use your templates or ours. DeedNetwork’s array of specialized tools makes preparing deeds easier. Whether you prepare deeds with your own templates or use ours, DeedNetwork provides all of the resources you need. Call us to speak with one of our knowledgeable deed specialists.